Today I stopped at the LQS and picked up some of Mary Ellen’s Best Press. I have been reading the reviews and I decided to give it a try. Today I washed a load of green fabrics and I knew some of those fabrics would likely end up quite wrinkled. I was very impressed with this product in removing those wrinkles effortlessly. The bottle says, “Mary Ellen makes ironing (almost) fun!” and I would have to agree with that statement. I think I am going to have to buy stock in this company! I spent Good Friday on line with Linda – Moving it Forward. We have decided that once a month we will take at least one day and move some projects that have stalled or aged as UFOs far too long forward to the next stage. That may mean getting a top to the flimsy stage, moving a top from a flimsy to a quilt, or completing some binding. What Move it Forward is not is a day to start something new. It is all about making progress on something we have already started previously. Before I could work on anything, I needed to clear my work surface from the project that I was working on the night before. In between passes of the long arm on customer quilts, I piece string blocks onto used Color Catchers (that is the white rectangle you see in the upper left hand corner of the picture). I had 11 blocks partially finished – they needed a strip or two and they would be finished. So before working on anything else, I finished off those 11 blocks. On the previous weekend, I took some of the blocks I have made previously and pieced them together into this colourful scrap top. This top needs the sashing finished off on the right hand side and bottom, then it will be ready for borders. 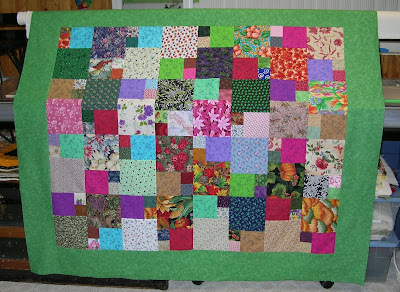 The next project I had to finish was a customer quilt that had already been loaded onto the long arm the night before. There was only about 1/2 hour of quilting left. This is the finished customer quilt. It is a Nine Patch Pizzazz quilted with the Wave. The next project was my Bento Box. It had stalled at the borders. I typically stall at this point so this was a great project for Move It Forward day! Also, I had the expertise of my good friend Linda to assist in deciding on which colour to use in the inner border……….green…. After discussing options back and forth, the red was chosen. And this is the finished flimsy. This one is for me so I am really excited about getting this top to this stage. I now need to go on the hunt for just the right backing. The next project up needed binding. This is the fabric that was picked for binding. I made 1/2″ wide binding for this quilt. An extra wide binding serves dual purpose as an additional border and binding. Strips of binding for a 1/2″ wide binding are cut 3 1/4″ wide. Binding was machine sewn to the quilt after supper. This top is now waiting for a quiet evening or two of hand sewing in front of the TV. The day was busy and my quilt inspector/supervisor played out. After the flash picture, he did open an eye to let me know that he did not want to be bugged further! I know that both Linda and I made great progress today so we will be looking forward to the next Move It Forward Day to move yet more projects to the next stage.